S. left this morning for Seattle; she'll be spending a week up there, visiting friends and family. So I'm home alone. Blogging. I don't mean to sound mopey. Because I'm not. And Paquito's here to keep me company. I didn't care too much for the editorial caption that accompanied it: 'dripping with color.' (Although, I guess it is...) S. and I just happened to be at the right place at the right time for this photo--about a month after we moved here a couple of years ago, we'd taken a Sunday drive up to the top of Mt. 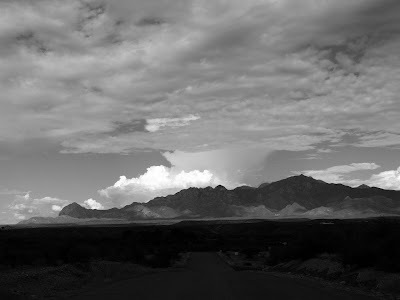 Lemmon; on the way down the Catalina highway, we stopped to stretch our legs at a scenic pull-off just as the sun was setting, and this isolated rainstorm just happened. The permanent population of the town is only four-hundred-something, but its proximity to Phoenix makes it a major weekend hang-out destination, very picturesque--ruins of 19th-century buildings...endless views of open sky and mountains...and a singular combination of stringy-haired Harley-riders, aura-seeking urbanites, jewelry-makers, a handful of b-&-b owners, blown-glass demonstrations, stray cats, the occasional carload of Japanese tourists, a rainbow-stickered-restaurant with crabcakes as their special du jour, and across the street a rough (and decidedly rainbow-free) tavern where no one would be caught dead uttering 'du jour'...À chacun son goût, non? so sarah is in seattle, we are leaving for seattle on the 24th for a visit. it has been 2.5 years since we have been back!!!! way too long. you photos are so beautiful!!! totally newspaper worthy.